I haven't previously been able to find any sort of update on the disposition of the criminal charges that were filed against University of Florida student Andrew Meyer after he resisted arrest while being removed from a John Kerry rally. However, the UF student newspaper, The Alligator, reported on Monday that "[t]he investigation by the Florida Department of Law Enforcement into [Meyer's Tasering] is complete, but the report isn't available to the public yet." A university spokesman is credited with predicting that the 300-page report will be made public today (Wednesday). As for the criminal charges, the article says: "The State Attorney's Office will make the final judgment on Meyer's criminal charges after it reviews the department's findings." Although cryptic, this suggests to me that the charges may have been put on hold pending the release of this report by agreement of everyone concerned. If the report is critical of the campus police's reaction, however, that conceivably might trigger a voluntary reduction or even a dismissal of the charges. I continue to predict that the use of the Taser will be found to have been appropriate, and that at least the resisting arrest charge will be deemed appropriate for the prosecution to pursue. But I presume that short of a complete voluntary dismissal by the prosecution, "final judgment" will actually be made by a judge or a jury, either pursuant to a plea bargain or the results of a trial. In the meantime, a Palm Beach newspaper reports that sales of "Don't Tase Me, Bro" merchandise (sporting graphics like the one I've reprinted here from Cafe Express) continue to be "shockingly profitable." The report found that the event organizers were within their rights and had ample justification in ordering Meyer to be removed, and that the campus police made reasonable choices in dealing with Meyer's resistance, including in the use of the Taser in "drive-stun" mode (using direct contact, rather than firing the prongs). It provides more detail than I'd previously read about Meyer's previous campus disruptions, along with further circumstantial evidence that he intended to provoke this incident and arrest. According to the UF student newspaper, "Eddie King and Nicole Lynn Mallo — the two officers who were suspended with pay after the event — are back on duty, UF President Bernie Machen wrote in an e-mailed statement." My guess is that they'll get a fresh round of applause the next time they walk into the campus police station. This report, of course, will be dismissed by Meyer's defenders on grounds that it's biased as coming from another law enforcement source, and it should indeed be read with awareness of that fact. But that doesn't mean it's wrong, and I don't think it is. My guess is that Meyer is going to have to do some non-trivial jail time if he wants to plead out; and if he rolls the dice and insists on a jury trial, my prediction is that he's quite likely to be convicted on the "resisting arrest with violence" felony charge, which could mean serious prison time. Were I Meyer's lawyer, I'd do my best to establish whatever credibility I could for my client's and my willingness to go to trial, and then leverage from that the best plea agreement I could get. I'd try to trade public service and acts of contrition for as much jail time as I could, and I'd try to negotiate for flex-time service that would permit Meyer to serve his sentence on weekends or holidays so that he could stay in school. That done, I might not Taser young Meyer in my private counseling on whether to take that best offer from the prosecutors, but I would indulge in every bit of verbal arm-twisting and brow-beating that I could manage. My guess is that Meyer and his parents would then fire me and get new counsel who's less candid and more publicity-hungry — someone who'll be happy for the TV time as Meyer's led back in handcuffs after the guilty verdict, at which point the lawyer can shake his fist and valiantly vow to appeal "Against These Fascists All the Way to the U.S. Supreme Court!" I'd hate to think of the static coming to anybody in the Department of Law Enforcement who turned-in his part of the report past the deadline. . . I'm ordering a half dozen tee shirts today!! This guy got more than he bargained for. Ain't it great?! Two items in this report caught my eye. On page 13 in the list of evidentiary exhibits, the MSNBC.com referenced item is titled "Student tasered for asking Senator Kerry about voter suppression". 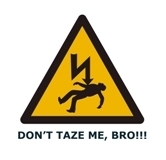 What, that was why he was tasered? No agenda here in the title of the story by MSNBC. Anyway, throw the book at the little nutcase -- that's my opinion. So Beldar, can the NY Times be held in contempt for not complying with a subpoena? Charlie, the NYT's subsidiary that has possession of the tape well might be held in contempt, if the prosecutors press the issue. The prosecutors might not unless they think that particular videotape has something unique that's not in all the others; but on the other hand, that may be why they issued the subpoena in the first place. (The low-res stuff we've all seen on the web might be adequate for the trial, but any prosecutor would love to have Meyer in all his spittle-flecked, squealing, whirling, and thrashing glory. They may just want the studio-quality video.) There's no confidential source involved, so even assuming Florida has a qualified privilege shield law, that wouldn't come into play. I can think of no valid legal objection that any media outlet could tender that would prevent the prosecution from subpoenaing and then copying their photos or videos of the incident. And you're right about MSNBC and its agenda. Everyone surely knows that Meyer was Tasered solely on standing orders from George W. Bush to protect the secrets of Skull & Bones. In another victory for technology, apparently the tasers record timestamps for when they are used and on what setting. So, contrary to the eyewitness testimony, the taser itself will tell you exactly when and how it was used. Like dashboard cameras, this will put a stop to some of the shenanigans that go on where defendants think they can lie and portray the police as brutal. When you [John Kerry] have done so, if you can then prove anything in the [Swift Boat Verterns] ads was materially untrue, I will gladly award $1 million. As you know, I have been a long and proud supporter of the American military and veterans' causes. I now challenge you to make this commitment: If you cannot prove anything in the Swift Boat ads to be untrue, that you will make a $1 million gift to the charity I am choosing -- the Medal of Honor Foundation. John, if your reading this, you can start here.